In the Ganges plain in Northen India in the middle of the first millennium BCE, the idea of “ahimsa” – non violence – emerges. Ian visits the intellectual hub of iron age India – the Kingdom of Magadha. He discovers a subculture of vagabond philosophers that developed two world religions; and the vegetarian order of monks and nuns who became the torchbearers of ahimsa. Play or download (41MB MP3) (via iTunes) or read transcript. I’d only been told about Rajgir the day before arriving. I was staying at the refounded University of Nalanda for a couple of nights, where I interviewed two people who lived in the block in which I was staying. Institutions like that are fantastic for my research. But one interviewee – Deepak Anand – told me the real place I needed to go to was Rajgir. My desk research had led me to places like Vaisali – which will turn up via Buddhist texts in episode two – but at Rajgir, modern Jains celebrated and could talk about what happened there two and a half thousand years ago. Finding guests with good English is obviously helpful. So it was gratifying to learn that the Veerayatan Institution at Rajgir was led by Jain sadhvis (nuns) who were very used to communicating with foreign and English-speaking audiences, because of their outreach overseas. When I got there, I discovered all the English-speaking sadhvis were overseas doing outreach. So I had very little time to find both a learned sadhvi, and a way of interviewing her. An English-speaking physician, a glaucoma consultant from the hospital on the other side of the site, helped me out and acted as interpreter; and I’m very grateful to her indeed. Dubbing a non-English speaking guest is a lot more work (Yasājhe’s words were retranslated carefully and then read by actress Sandeep Garcha) but I’m glad now that the first words you hear from a guest in the series are in Hindi. This left me not much time to get to the station for the train back to Patna – later Magadha capital and current Bihar state capital. The background noise at the start of the show was from two different journeys: a crowded auto-rickshaw in Mahabodhi, and that train I took back to Patna. Both were travelling the kinds of routes Śramaṇas would have taken within ancient Magadha. Particular thanks to Dr. Smita Bagrecha for interpreting Yasājhe at short notice. 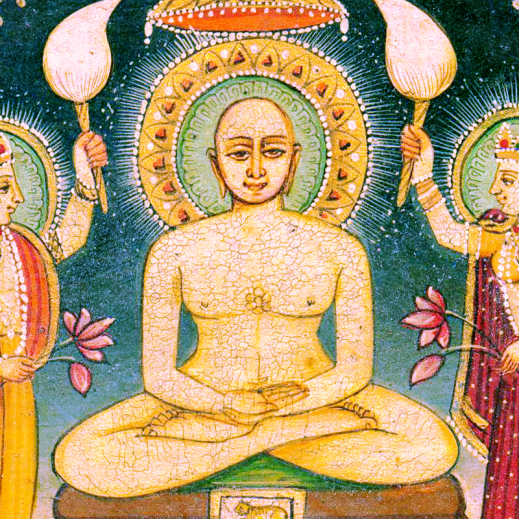 The featured pic is public domain painting of Mahavira, Rajasthan, circa 1900. Interesting. I look forward to the next episode. Thank you. Neither ahimsa nor vegetarianism began with jains in India. You are spewing utter falsehood. You seem to b interested in distorting history. And there is not equivalent of abrahmic “nuns” in any of dharmic faiths. The nuns in christianity have a completely different role than any of the female rishis in the dharmic faiths. The show fully reflects the fog of history that surrounds the emergence of ahimsa in particular and vegetarianism in general. But the experts I talked to and sourced I examined do point to the Jains as the earliest group for which there’s good evidence; if there was an earlier group than the Jains, they unfortunately didn’t leave enough evidence behind. I agree that there’s a fundamental difference between the calling of a Christian monk or nun, and the status of a Jain Sadhu or Sadhvi. But Jains themselves describe them as monks and nuns when communicating in English. I’ve been told by a Jain broadcasting friend that I erred a bit too hard on the side of including untranslated words (like Sramana, Ahimsa, or Dharma), and I think extending that to “Sadhu” and “Sadhvi” would have been too demanding to non-Hindi-speaking listeners. I have had a long discussion on the India vegan revolution group on fb on this. If you are on that group, you can see what arguments are there. If you tell me that jains were the first vegetarian group, that is one thing to state. On the other if you state that with jainism was introduced the concept of ahimsa or vegetarianism then it is clearly untrue. Since you did not include Jha in the 2nd episode on buddhism whereas his book talks of buddhism and meat, it does not leave a positive impression. Let me know if you are or are not on that group. In which case I will pose the arguments here. As for monks and nuns, the easiest thing was to use male and female monks. With usage of Christian terms, the non-Sanskrit knowing populace would not conflate it with their idea of what a nun is. Therefore it would not be unfair to them as well as the jains. Certain non-translatables exist and care must be taken in using them. I like that you did not change those words, and wish you would have done the same with sadhu and sadhvi. And the win-win situation demands explaining what those terms are in a small manner, but retaining them as such. While the jains would understand what the english word is referring to, what it means and so on, the non-jain (abrahmic faith people especially) would not be able to understand the concepts as distinct. In case your focus is on the truth, then the above approach is what I would recommend as feedback. Retaining the non-translatables is a must in expressing the truth. Please refrain from personal attacks. I have put a lot of time into getting this right and doing different opinions justice. You clearly disagree, but you should be able to express that without casting aspersions on my motives.